Eager went home on Friday - apologies for the late update - I really have no good excuse except that the days are so short at the moment that lots of stuff is just having to wait till I have more time. 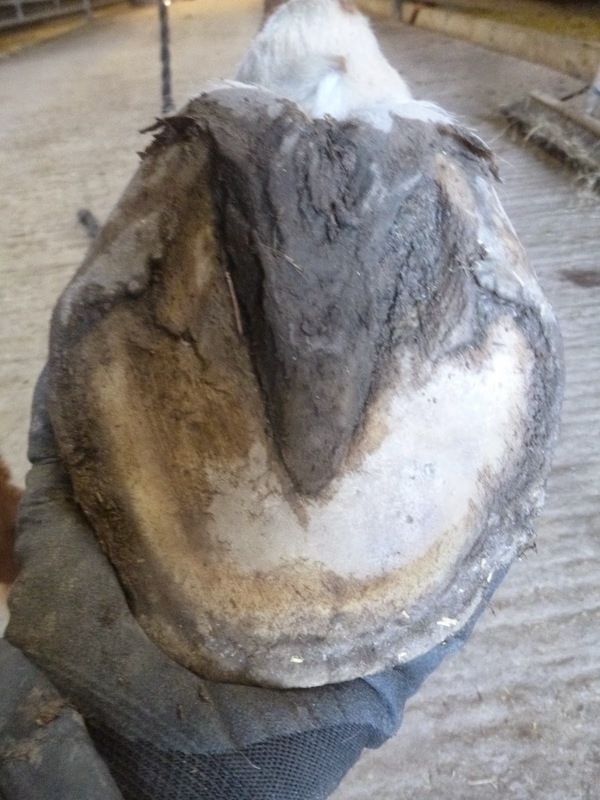 Eager had pretty nice looking feet when she arrived (the upper photos of each pair) and she had never been shod but her palmar hoof was weaker than it should have been and not surprisingly this (plus her media-lateral balance) was the area where the problems originated. We were able to do a lot of work with her fairly quickly and as she started with a baseline of a fairly strong foot she has made good and rapid progress. The lower photos in each pair show her feet after 10 weeks. Unfortunately I had to take her final photos with a different camera to normal (its a lot bigger so I can't get the same angle as with my nifty little pocket camera) which is why the shots aren't quite true comparisons. 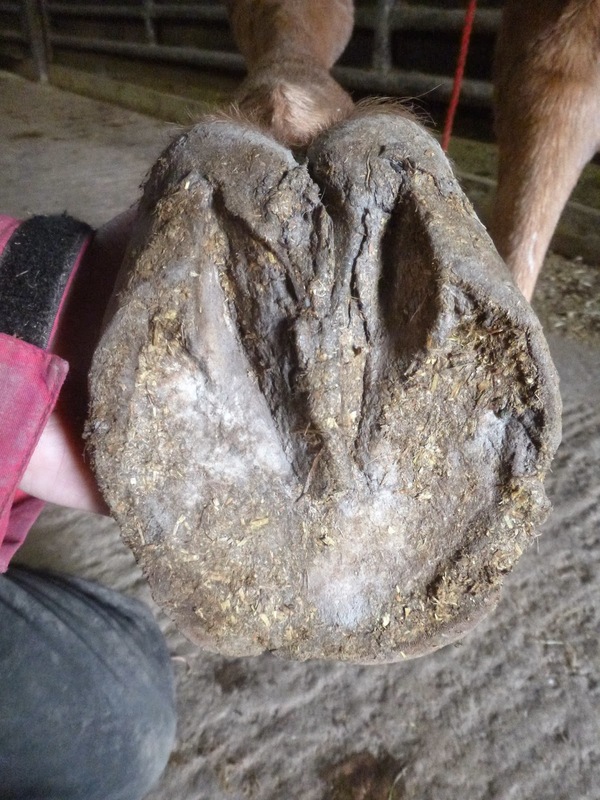 Nevertheless I hope you can see that her palmar hoof is stronger now than it was when she arrived. Her frog and digital cushion are more robust and have more width and depth. As a result of this her toe is shorter and her foot is more supportive of the whole limb. I know this is something I always bang on about but I hope these photos show that these types of changes are nothing to do with trimming and everything to do with building stronger internal structures to the foot. Full marks if you also observe that her feet are also changing their media-lateral balance - and in fact this is the area where she had the greatest challenges. Like many horses who come here she was also lacking medial support in her feet - this is something she is gradually improving but it will take another few months - until she has grown in a full hoof capsule - before that is in place at ground level. 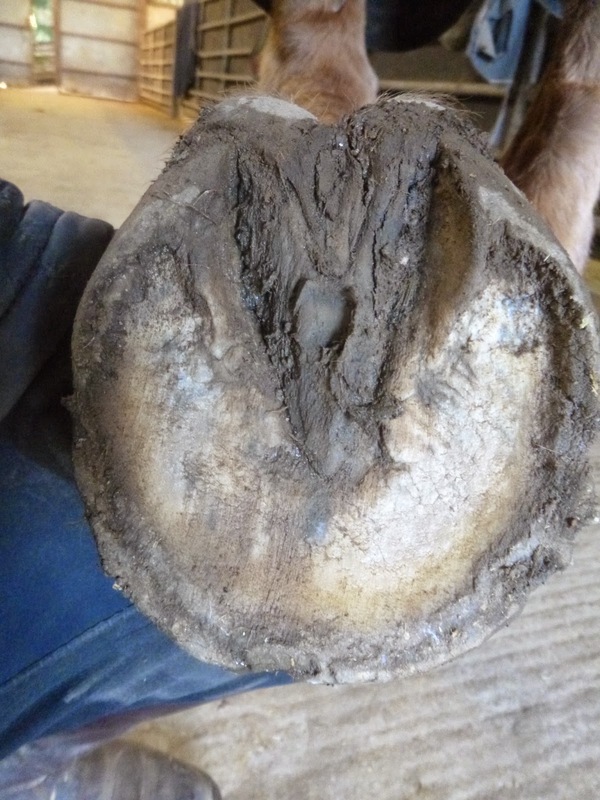 Its all about the foot supporting the limb - and 99% of that comes from within the hoof capsule. I'm conscious that the blog has been a little sparse for the last few weeks - I would love to be blogging more but I am trying to make time to progress not just the ongoing research but the potential new study which I blogged about last month. This should result in an update of the Project Dexter data as well as the new MRI-based research proposal so I think its worth the effort (I hope so!). However, I am planning this week to squeeze in updates on Bruno and Eager but we are also trying to get some urgent fencing finished - not very Christmassy but very necessary! As many of you know, Freya is here for the winter and has brought Birdie with her. He hadn't ever hunted before but we all thought he might enjoy it and on his 3rd day out I managed to get some photos for Fiona, Freya's mum. Birdie was more than ready for the off - keen as mustard and seconds later was charging up the hill! ...which did not suit Birdie at all. However this was pretty much the last time we stood still so he had plenty of chances to show off his newly-acquired skills at crossing all sorts of terrain. A tired but happy horse and rider at the end of a wonderful few hours - well done Birdie and Freya and lets hope for many more days like this to come! This is Bruno having a munch on the front lawn - a special privilege as there is masses of grass there and he needs all he can get! Lets hope for more weather like this - winter sunshine really makes these short days seem longer! Bruno arrived 3 weeks ago and I posted his original photos in this post. Time for an update although as he was landing even more toe first than Alfie (whom I posted about yesterday) it would be too much to expect him to be landing heel first already. 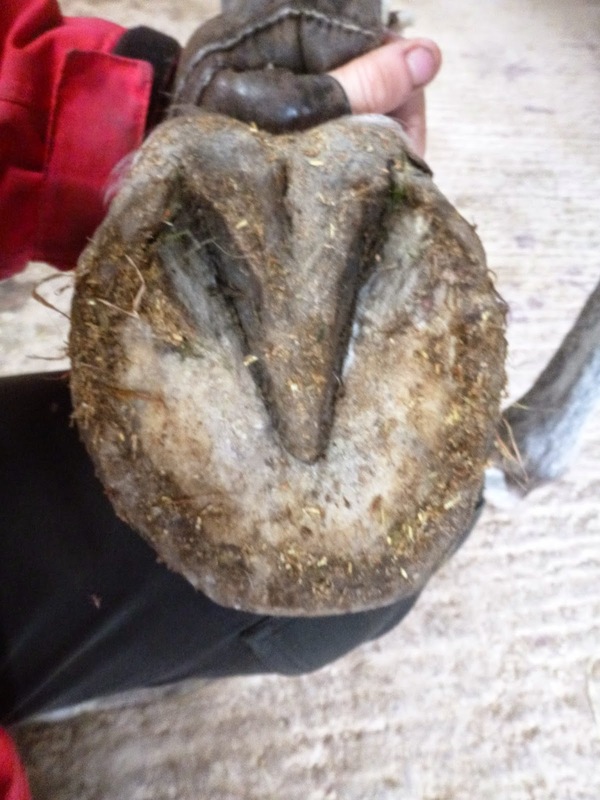 He has the typical under-run heels and long toes which we commonly see on horses who have only had a short time out of shoes but already his toe is shortening (on its own - no trimming required) and his hairline is straighter which indicates the palmar hoof is getting stronger. Sole shots show a frog which is improving and a big shift beginning in his media-lateral balance. His breakover is going to be way back once his toe has shortened and that should also allow his heels to stop collapsing and come back to a more supportive position. This is an interesting shot as it shows that the foot is becoming more balanced - there is better symmetry at the level of the frog and digital cushion and the palmar hoof as a whole looks tougher. 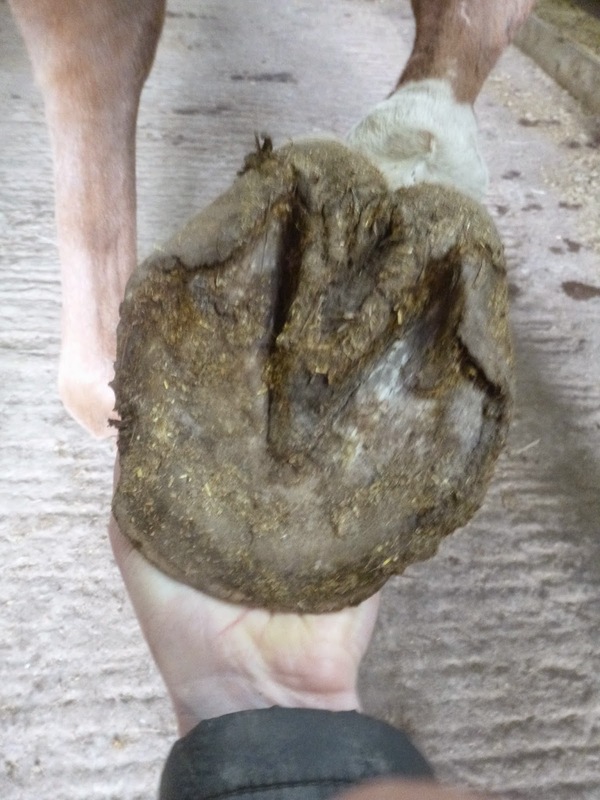 There is going to be quite a difference in Bruno's hoof angle once he has grown a bit more hoof capsule. You can just about see a band of new growth at the top and if you project that down to the ground at the same angle you get a sense of where his heel and toe will be in 6 months' time - a much shorter toe and a much less under-run, more supportive heel. Bruno's frog has started to widen as have his heels and as on his RF the toe has begun to shorten. For now his heels look high as he has shed a layer of frog but that will grow in pretty fast and that should make a big difference to his landing as well. Alfie D has been here 4 weeks and I've just managed to get some revised footage of him which I am really pleased with. As you can see he has improved significantly. 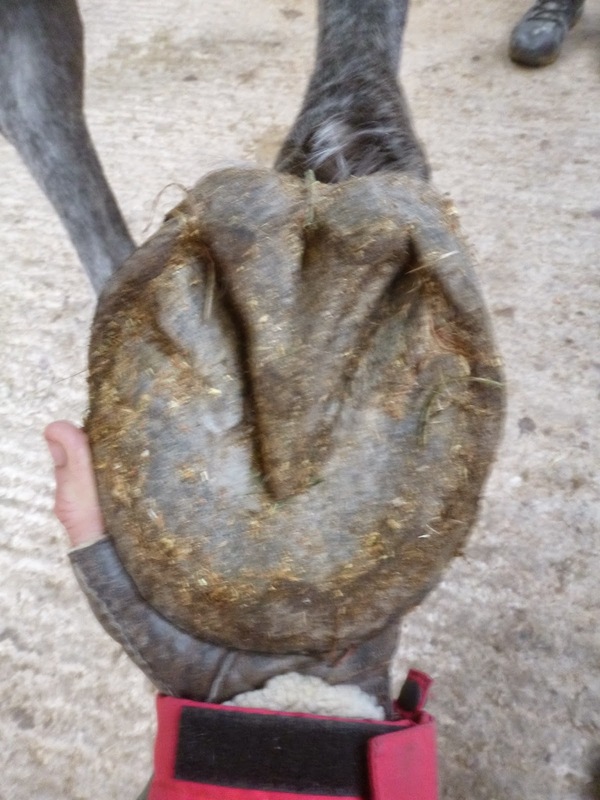 This is important because now his landing is heel first and he can engage the palmar hoof properly it means we can work him on tougher surfaces without risking strain to his DDFT. 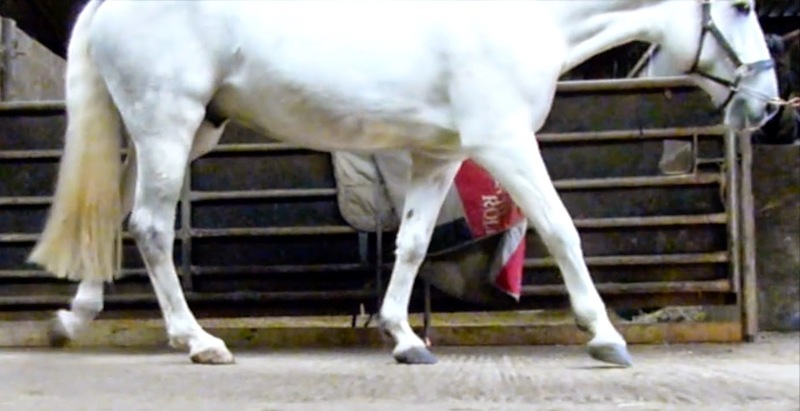 This in turn is important because it will help his new hoof capsule grow in faster which will allow his foot to rebalance faster. A win-win situation. Plus of course its much more interesting for Alfie to go out and about rather than work on a surface.